Most smartphone tracking firms get their numbers from vendors or the supply chain, but GfK uses point-of-sale terminals to get a sense of what’s happening on the demand side, including sales value as well as volume. The latest numbers show value increasing more rapidly than volume, resulting in a jump in average selling price (ASP). The first table below shows both sets of data for Q3 2017, split regionally and compared to the year-ago quarter. They haven’t done the maths for us but dividing the value by the volume yields the ASP and we can see that it was around $299 globally last year but has jumped 20 bucks to $319 this year. 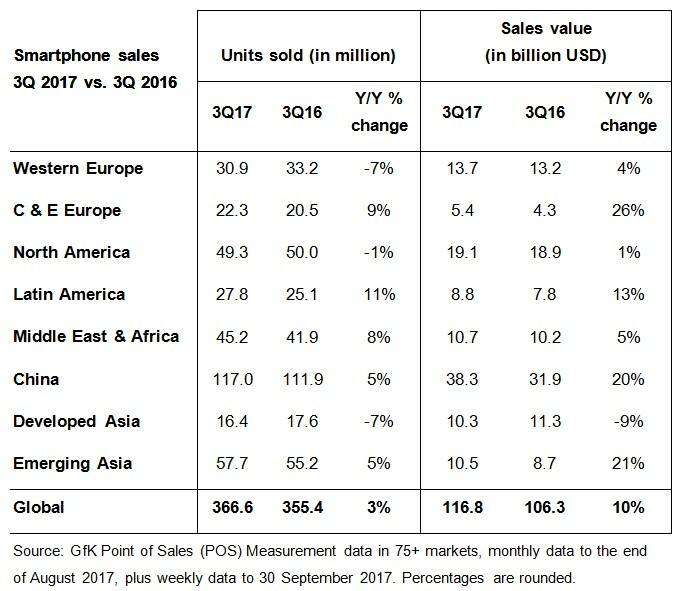 “Although unit sales may be down in some regions, the increase in ASP reveals the fantastic opportunity to grow the value of the smartphone market,” said Arndt Polifke, global director of telecom research at GfK. “This is welcome news for manufacturers, particularly in regions such as Western Europe where saturation has resulted in declining sales volumes year-on-year. “The industry has clearly been switching its focus to drive sales value, and top tier global brands, such as Apple, Google, HTC, Huawei, LG, Moto, Nokia, Samsung and Sony, either already have, or will release, new premium models in an effort to upsell customers to their flagship devices. As you would expect the annual numbers below also reveal an ASP increase. It’s also worth noting that the annual ASPs are higher than the Q3 ones. 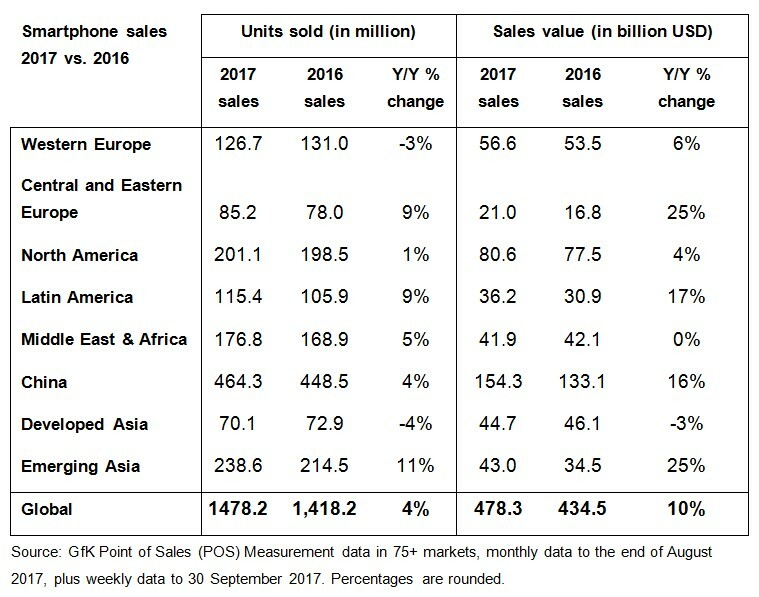 This is almost certainly due to the fact that Apple always makes its new, expensive phones available in Q4 so the ASP in that quarter is probably the highest.